Globalization has been a factor that has brought countries closer worldwide, and Multinational Enterprises (MNEs) are eager to look for new market opportunities in developing countries. This chapter analyzes the implementation of MNEs' global ethical principles in business into local moral standards of societies from developing countries. The author will discuss, using current scenarios, how principles of both moral relativism and moral absolutism can provide a profitable or punishable opportunity within developing countries when MNEs operate accordingly, or not, to ethical decision making processes in business. Additionally, the chapter proposes how MNEs' managers can discover the limits of moral free space, to distinguish a moral value in tension with their own from one that is intolerable. At the end, it is expected that MNEs' managers can apply ethical decision making in business by clearly perceiving and understanding their corporate culture in a developing country society. 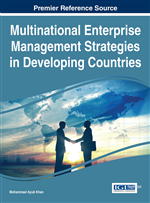 This chapter analyzes the implementation of MNEs' global ethical principles in business into local moral standards of societies from developing countries. The author will discuss, using current scenarios, how principles of both moral relativism and moral absolutism can provide a profitable (beneficial), or punishable (detrimental), opportunity within developing countries when MNEs operate, or not, according to ethical decision making processes in business. To sensitize about the moral dilemma within the migration of MNEs into developing countries. To explain how concepts of morality (moral relativism, moral absolutism) can influence MNEs' business ethics in their integration to a developing country's society. To demonstrate different global ethical approaches for the integration of MNEs in developing countries according to the UN Global Compact Principles. To propose a guideline for MNEs to overcome the barriers of dissimilar moral realities within developing countries.